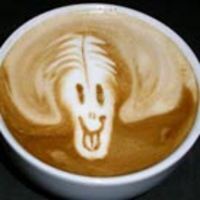 The text on the Latte Art site is in Dutch, but the etching gallery is not to be missed. Though it's tempting to dab a bit of Din's Ethiopia Harrar behind the ears in the morning, there is a fragrance out there that's perfect for coffee-lovers. L'Or de Torrente is a subtle blend of coffee and roses, a warm, alert, optimistic scent that's feminine without being too sweet. I bought some on eBay years ago, when this European scent was impossible to find stateside. Now you can buy it more conveniently, if less romantically, on Overstock.com. 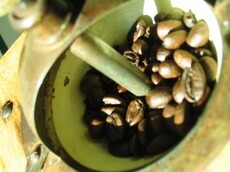 I just added a couple of new photos to the Ristretto Roasters photo album, taken today at my home in London. My boyfriend (those are his hands, at left, pouring the beans into our grinder) and I had a hot pot of the delicious Ethiopian Harrar after lunch, which filled the house with the most delicious aroma and had me going back for seconds. Not bad, considering I've never been a coffee drinker. I asked my mother-in-law the other day if she'd tried the Ristretto coffee that we bought for her as a gift. She replied that she hadn't finished her current open jar of coffee yet, and would try the Ristretto when she had. I love this woman, but her response made me see red. "This stuff is like fine wine!" I exclaimed. "It's perfectly fine to have several different kinds open at once!" And lo, the Ristretto Roasters was opened, and received fantastic reviews from all. No surprises there, then. Not being a real coffee drinker, though, it has occurred to me that I may just be incorrect in this instance. What do you think? Is it okay to have several different varieties of coffee on the go at once, or should they be opened and finished one batch at a time?